Switchgrass is an important bioenergy crop with the potential to provide a reliable supply of renewable energy while also removing from the atmosphere and sequestering it in the soil. We conducted a four year study to quantify sequestration during the establishment and early production years of a young switchgrass stand in the northeastern USA. 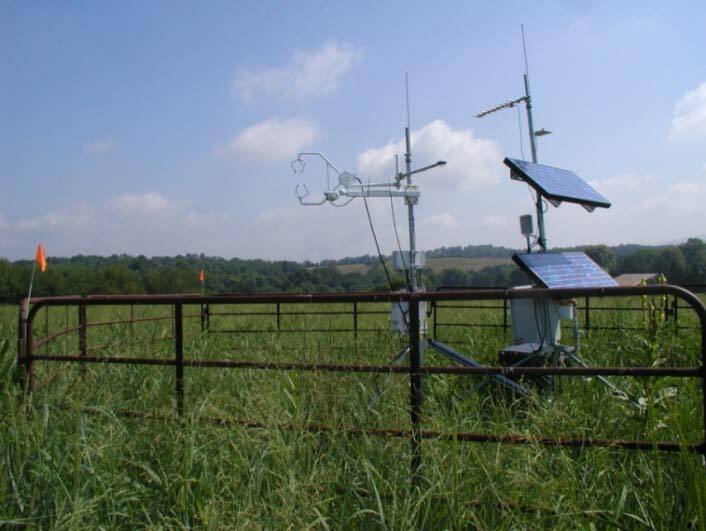 Carbon dioxide uptake was low during the first growing season (2005) due to the immaturity of the crop and to moderate drought conditions which existed that summer. Net uptake was restricted to a four month period each year from May through August, whereas the rest of the year experienced a net loss of to the atmosphere. The amount of harvested biomass increased each year as the stand matured, from 837 lbs dry matter acre-1 for the spring 2006 harvest to 3446 lbs acre-1 in 2007 and 5333 lbs acre-1 in 2008. Averaged over four years, this field sequestered 0.6 ton acre-1 yr-1. The amount of carbon sequestered increased each year for the first three years as the amount of taken up in the summer increased more than the increase in losses due to wintertime respiration and spring biomass removal. However, a small decrease in summer uptake in 2007-2008 compared with the previous year (-7%), combined with a small increase in wintertime loss (+9%) and a large increase in harvested yield (+55%) caused the field to experience a net loss of in 2007-2008. Switchgrass bioenergy crops in the northeastern USA can function as sinks for atmospheric for at least the first few years following establishment, in addition to their primary function as a source of renewable energy.